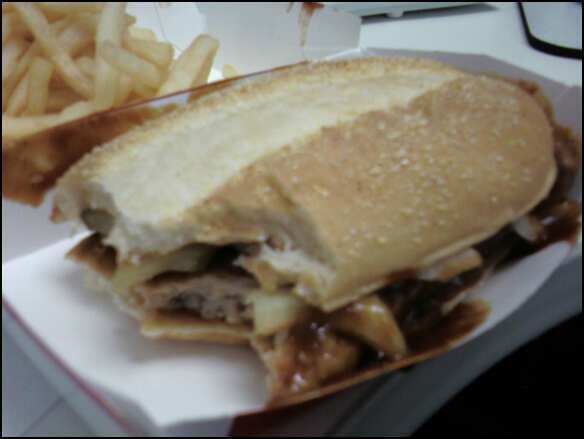 November 14, 2011: the day I tried McDonald's McRib sandwich for the first time in my life. I remember that day clearly: it was an unseasonably warm, sunny Monday afternoon, and for some odd reason I was aware that the final day of the McRib at my local McDonald's was that day. Some may call it divine intervention, others fate. It was now or never, do or die. Who knows if/when the McRib will ever return? For all I knew, it could've been a few years or an eternity spent waiting for something that'll never arrive since Germany is the only country that offers this bbq sandwich all year round instead of offering it as a promotion every few years. I felt compelled to write about the McRib because I just saw a commercial for the Memphis Pulled Pork sandwich from Burger King. Could Burger King's version of a bbq sandwich dethrone the almighty McRib? Only time will tell. You know the McRib has achieved cult status and a strong following when The Simpsons had to parody the McRib with its very own Ribwich sandwich at Krusty Burger. To my surprise, the McRib was quite a good sandwich. It is topped with sweet bbq sauce, pickles, and onions in a bread roll. The pickles and raw onions gave it a good crunch contrasting from the bread and meat. What amazes me are the "ribs" itself. It's a culinary marvel that McD's was able to shape a meat patty to resemble a rack of bbq pork spare ribs for a sandwich - genius! I was talking to a friend and he was telling me how he was expecting the McRib to be kind of like a pulled pork sandwich. Dude, this is a sandwich whose name is prefixed with a 'Mc' in Daly City, CA not a bbq joint in the South - or Burger King now [review of Burger King's Memphis BBQ Pulled Pork sandwich coming soon]. It was definitely a good sandwich, but I'm not sure if I'd order it again. Even though I don't have a "Go To" sandwich for McDonald's like I do with other fast food places (ie Carl's Jr's Bacon Western Cheeseburger or Burger King's Whopper), it's quite hard to deviate from the McDonald's dollar menu or its iconic Big Mac sandwich. However, the McRib is definitely deserving of its status as a cultural icon in the culinary world.